Would it surprise you if I said that Monster Lair, and not the great Ys Book I & II, was the game that sold me on the TurboGrafx-16 CD-ROM attachment back in the day? Well, it's the truth, shocking as it may sound. That's not to say Ys Book I & II didn't jump to the top of my "to buy" list as soon as I laid eyes on it. Honestly, how could it not--what with its amazing (at the time) animated cutscenes and Red Book audio, both of which were unheard of in the (console) gaming world until the PC Engine/TurboGrafx-16 CD-ROM attachment was introduced? Anyway, none of that is important at the moment. What is important is that Ys Book I & II, like Final Fantasy before it, solidified my interest in the RPG genre--something for which I'll always be grateful. Note: In this post, and in all subsequent '10 video games that made my life gayer' posts, gayer is used in the old-fashioned sense, as in happier or merrier. 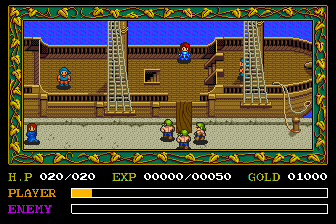 I have never played the Ys-games, or for that matter even SEEN them on screenshots. A bit crazy, I think. Is it an expensive game to get (maybe I should go with emulator if I just want to try it out). Me neither, Starfighter. I had a friend who was in love with the games, and I never actually played them or saw them being played. The bump fighting thing would turn me off in an instant, though. Hey you guys! Yeah, the bump fighting mechanism is weird and really isn't acceptable these days. If you can put up with that, though, they're pretty good games. BTW, more modern remakes and sequels of these games have more traditional, Zelda-like controls, I believe. Oh, and starfighter -- you can buy and download Ys 1 & II via Wii Virtual Console if you have a Wii. As much as I liked the game back in the day, though, I'm not sure I would recommend buying it today.